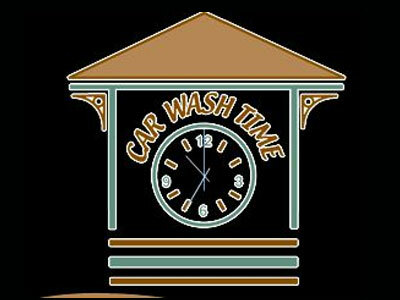 Car Wash Time opened in the Indian Springs Shopping Center next to the HEB pumps in 2006. We continue to grow because loyal customers refer us to friends, family and associates and they too quickly become loyal customers. We have earned our customer loyalty through outstanding professional customer service, convenient-flexible services, state-of-the-art equipment and quality car-care products. For customer convenience,we are open 24 hours a day for self-serve, and attendants are on duty from 7 am to 7 pm every day of the week. An additional benefit for detail services customers is our shuttle service. To make life less tedious for self-serve customers we accept coins, cash and major credit cards including Visa®, MasterCard®, Discover® and American Express®. What could be easier....well try our Paymaster Teller®. Swipe your credit card, use any or all our self services, swipe your card when finished, get a receipt and you are finished! One of our greatest benefits to customers is the flexibility of our services including detail services, express wash, and self-serve. We feature the highest quality products from Meguiar’s®, Turtle Wax, Lexol and RainX®. So, whether you like to do-it-yourself, want a complete exterior wash in 5 minutes, OR have a special need that requires our detail services (Detailing packages start at $29), Car Wash Time is the place for you. Our friendly staff is always ready to help you. Don't forget Car Wash Time pre-paid gift cards, perfect for that hard to find gift. Receive a 10% bonus with any gift card purchase. We are opened 24 hours a day for your convenience. Our self-serve areas are covered, well-lighted and monitored by security cameras. Our state-of–art, self-serve bays use Turtle Wax products. For our customer’s convenience, these bays are operated by coin, cash or credit card. A change machine is also available on the premises, plus a car care vending machine. Wash, vacuum, wipe down interior surface, air blow all crevices, cup holders, cracks to give your interior a like new feel. Shampoo and steam clean carpets to refresh and sanitize your interior. Keep your leather looking new with Lexol® cleaner & conditioner. Quickly and safely removes oxidation and blemishes. Restores deep gloss and provides a durable wax finish. Clean your car’s surface of bonded contaminants & then add Meguiar’s® synthetic paint sealant for up to six months protection. Combine carpet shampoo & leather cleaning & conditioning with complete interior cleaning, vinyl cleaning & conditioning, odor and stain removal when possible. Removes light to moderate swirls, oxidation and paint defects in addition to Clay and Wax. Appointments - We Provide Shuttle Service!